Concrete is much more than a building material but if you plan to use it as a finish, it’ll take time and dedication to make it look right. Here’s how. Long gone are the days of raw, unfinished concrete floor surfaces, once the mainstay of commercial and industrial buildings. Now we can make the most of this versatile material and have it look good too. Over the past decade concrete has been used for many purposes. 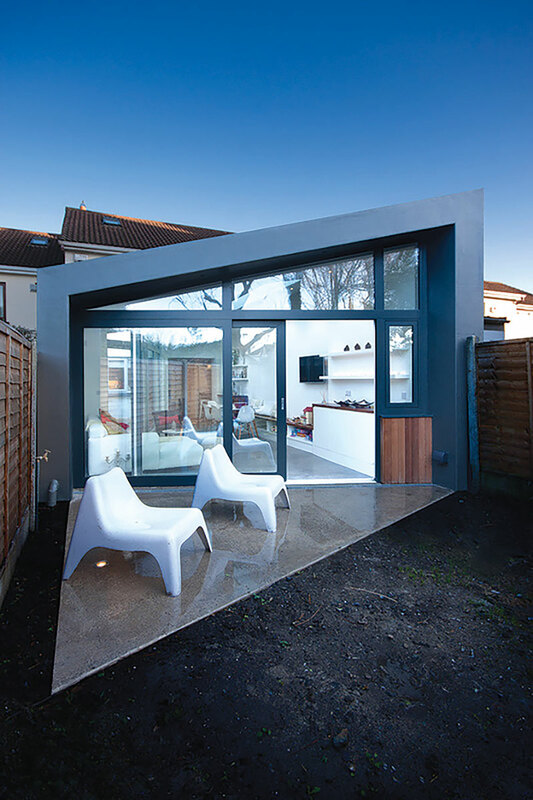 In its raw form it can be shuttered and designed in a way that makes its shape and surface aesthetically appealing for walls and many other architectural features. 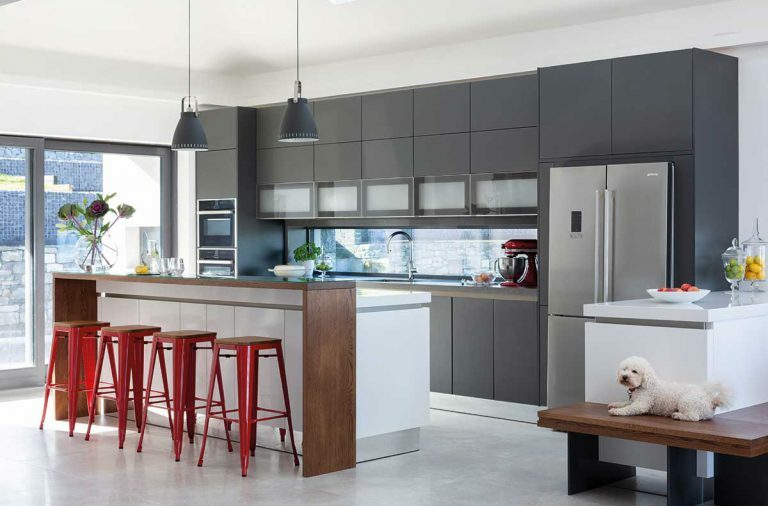 In our homes it has also become an attractive, albeit relatively expensive, alternative to other floor and countertop surfaces. Concrete is a seemingly simple material that can withstand a lot of abuse in general construction. But extra care must be taken when creating a concrete surface that will remain visible. Once concrete has cured (dried out) it has a somewhat unimpressive appearance. In normal construction this doesn’t matter to anyone as it gets covered up. 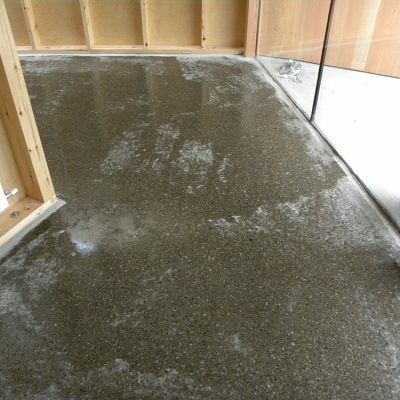 Polished concrete is very different from this basic poured finish material as it involves taking off top layers to reveal the sand and/or the aggregate beneath. 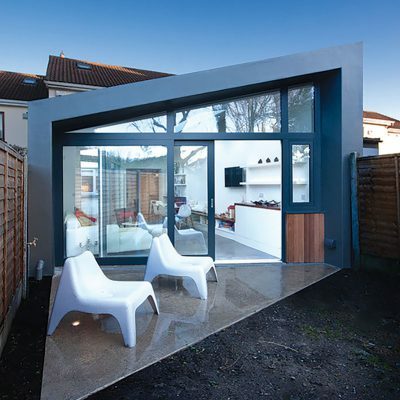 This time-consuming and skilful process can transform concrete from a workaday building material into one of stunning brilliance. You’ll need an early discussion with your supplier about exactly what type of finish you’ll want on the surface of the concrete. Some people enjoy the individual aggregate pieces showing when ground down; others like the look of a smooth, stone-free, almost ‘cement looking’ surface. It can be made to be very shiny or totally dull. It can even be coloured with stains or dyes. The size of the stones in it can also be controlled. Scoring to create bands, lines or borders can produce interesting effects. Stencils and handcrafted saw cuts can produce logos and other decorative effects, although this will greatly increase the cost. It is also possible to sprinkle various types of decorative aggregate into the top layer of the concrete before it dries. This, when ground down, can then look wonderful. 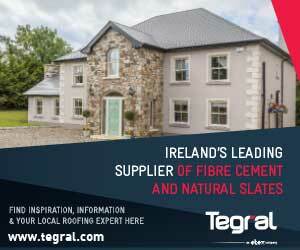 You can alternatively choose to have concrete made with ‘designer’ aggregates chosen by your supplier. But again, this is an expensive route to go. Probably the commonest question on this subject and the most difficult to answer. 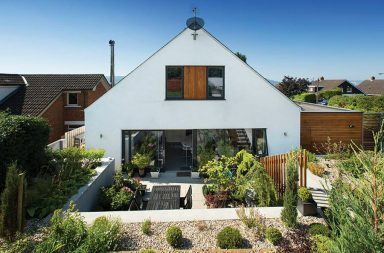 Costs depend on whether the concrete is new or existing, on what scale you’re thinking as larger surface areas can be relatively cheaper, how complex your final finishes will be, and much more. Prices can vary from £20/€25 to £150/€180 per square metre but I’ve known people who have spent £400/€480 per sqm! 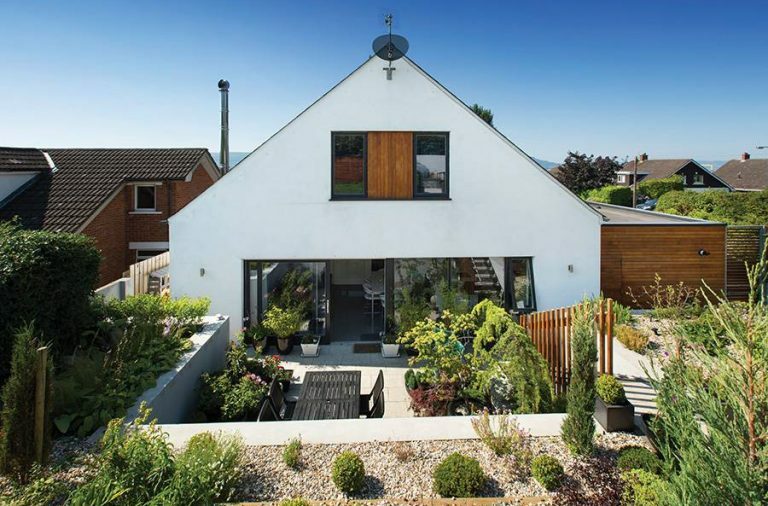 If you’re thinking of going this route then get quotes on a like-for-like basis from more than one specialist contractor. Be sure to see examples of their work in the real world, not just on a website or in photos. Anyone who promises you a great effect for little money should be avoided. Can you polish an existing floor? Yes but it’s worth taking advice about the condition of your existing slab before starting out on the long and expensive road to a polished finish. Cracks, delamination and dusty surfaces can usually be dealt with but if your concrete is beyond repair it’s crazy to start. 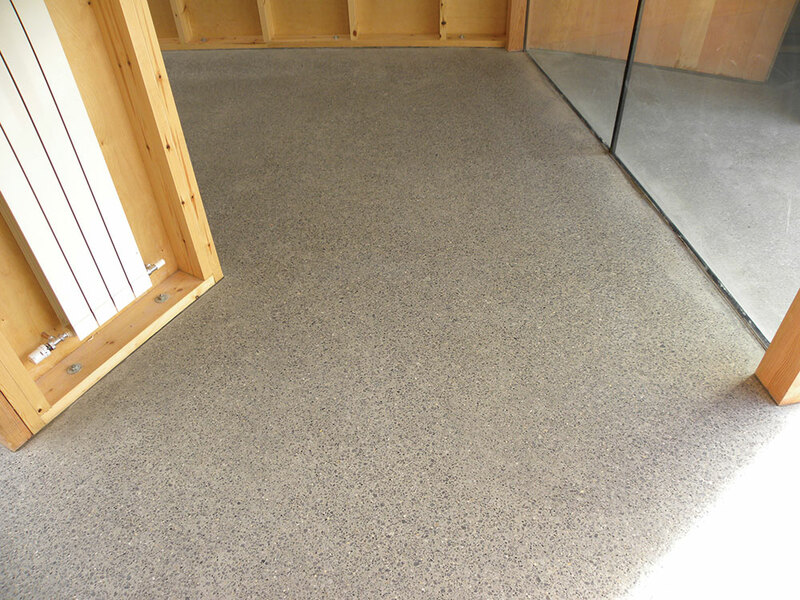 If your surface is too poor to polish, talk to a specialist company about concrete overlays. You must also take into consideration the levels, as when grinding you will be taking up to 5 mm off your floor. 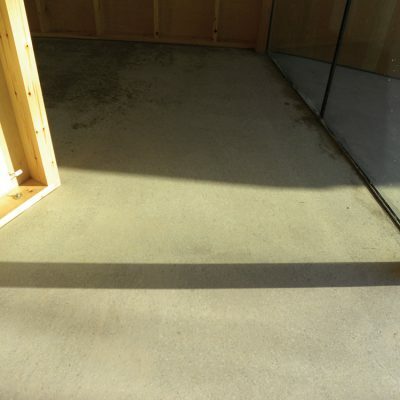 Obviously, the colour of the concrete, determined by the colour of the sand used when making it, and the aggregates in the original mix are all out of your control when you opt for polishing an existing concrete surface. 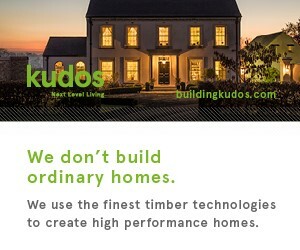 This means you could end up disappointed; but it also means you’ll have a very sustainable floor, as it’s there already! In my opinion the best route to a perfect result is to involve professionals right from the start. Your main contractor will install the sub floor – a slab of concrete with reinforcing bars, plus insulation beneath – ready for the specialist polished concrete floor contractor to install his, usually 100mm thick, concrete floor on top at a later date. Your heating contractor will need to install the underfloor heating pipework before the finished floor concrete people come. 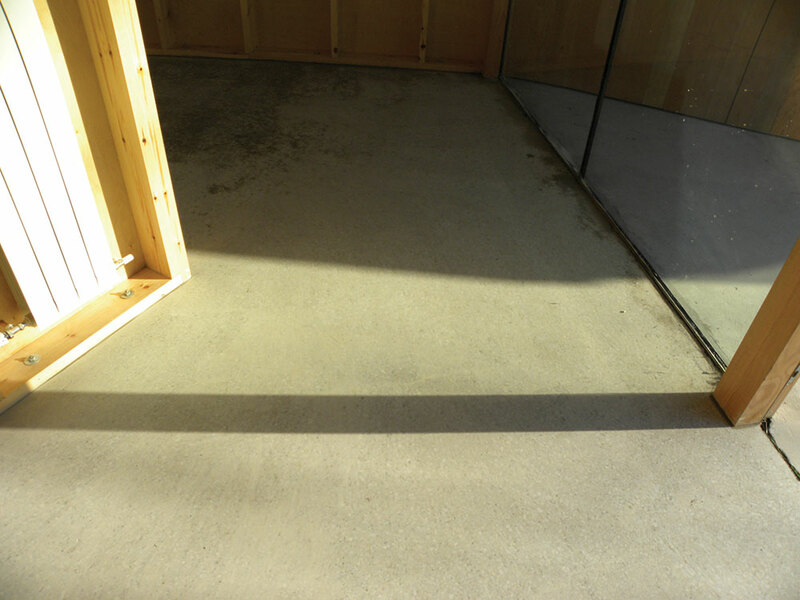 When your specialist contractor installs the finished concrete floor, he’ll take care to measure slump, as it’s best to install the concrete fairly dry. If too much water is used, cracking is more likely. This is in contrast to ‘pourable’ cementitious flooring screed that is pumped into place as a liquid, finds its own level and then left to harden. 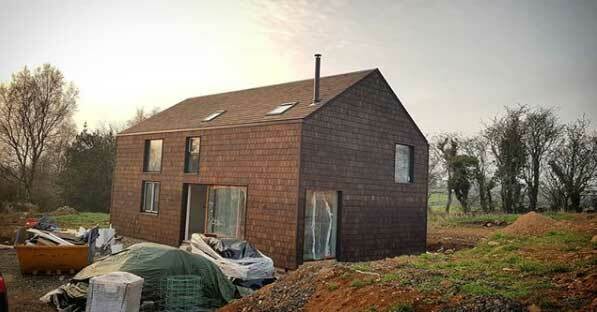 It’s important to note such material is not concrete as there is no aggregate. These types of floors aren’t suitable for polishing. Special care is required during and immediately after the concrete placement. Power floating will be needed to produce a smooth, level, surface but when placing concrete destined to become a polished floor extra special care and attention needs to be paid to the perimeters. These can often be botched in normal concrete floor situations, even with power floating and hand trowelling. 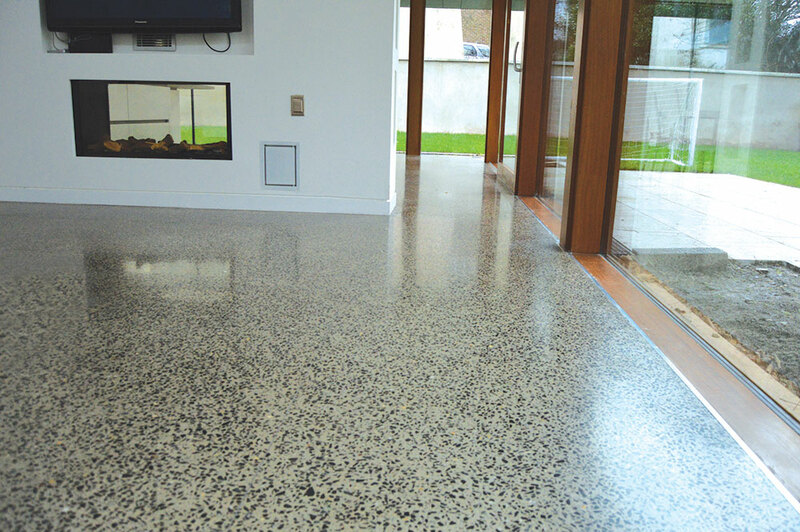 The levelling, floating and finishing of the concrete needs this high attention to detail because when the surface comes to be ‘polished’ – ground down using a heavy duty, diamond-encrusted sander type piece of kit – the surface you are left with will become your final one. The better the surface when the concrete is placed, the less work there’ll be to do when it is polished. A repair will always look like a repair. 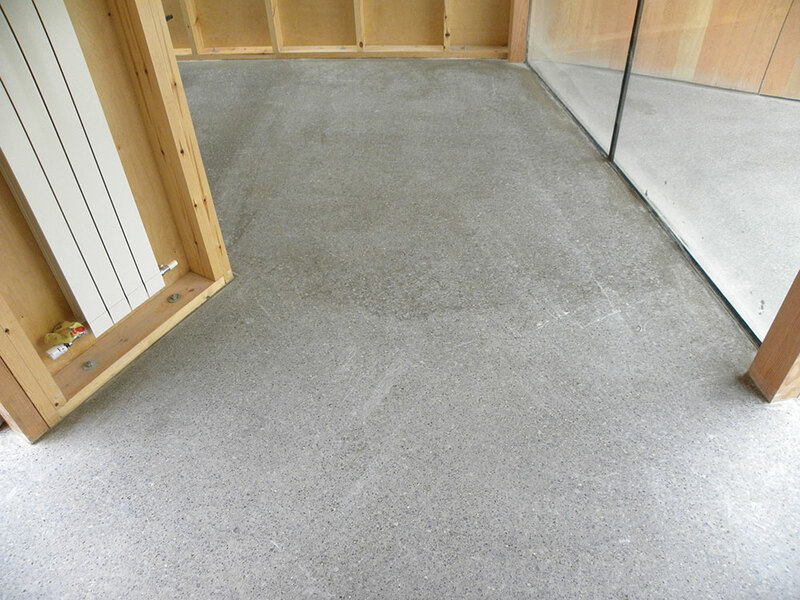 If the weather is likely to be either hot or frosty during installation, the surface of the newly installed concrete must be properly protected, as any small cracks or imperfections occurring during the curing process – that would normally be hidden under other flooring surfaces – will be evident as permanent blemishes in your floor. Similarly, your specialist installer will advise how to prevent, as far as possible, any settlement cracks that under normal circumstances wouldn’t matter but are now on public view. Such cracks can appear many months or even years after installation. There has to be a plan for how to deal with these. They are more likely to occur if you are using underfloor heating (see Heating/insulation). Once installed and cured, the concrete should be well protected while other construction takes place. Pieces of scaffolding, for example, dropped on to the surface can cause blemishes that are near impossible to remedy. 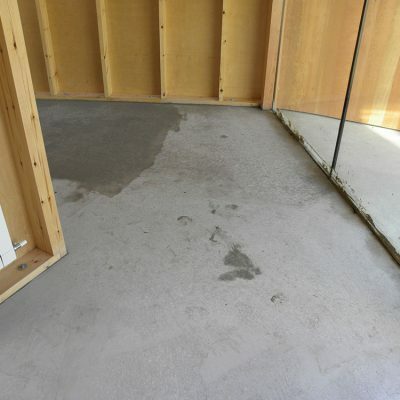 Of course, once the concrete is polished and ‘finished’ it has to be lovingly protected as if it were a timber floor. In this regard it’s vital to get the surface protected so decorating and other liquid building materials don’t stain it. Your supplier will tell you how he intends to do this. In practice this calls for a very good general contractor who cares. One of the challenges when installing such a finished concrete surface is how long to leave it to cure. 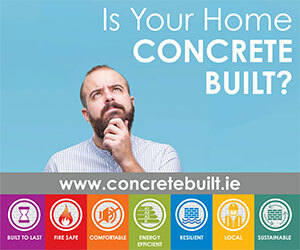 The answer is that concrete takes years to dry out completely! 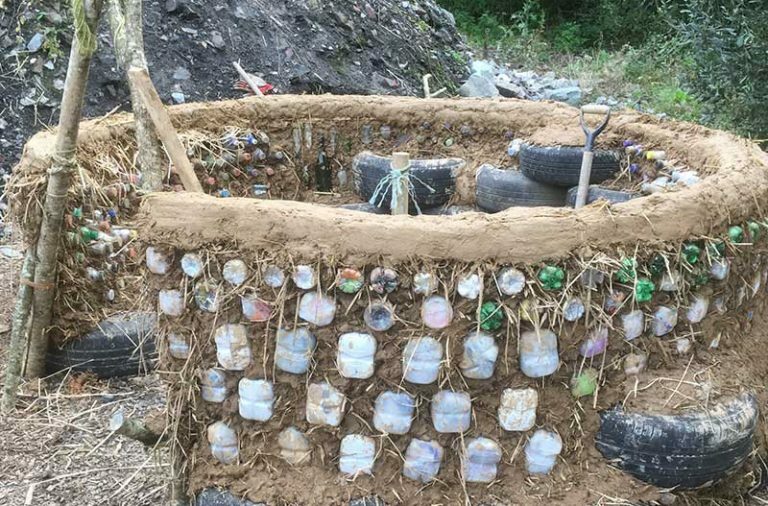 But the reality of building sites means someone has to take a view about how long to leave things before covering up the concrete to protect it, which inevitably slows the curing process. 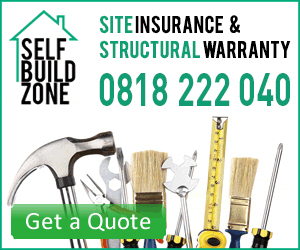 Your specialist contractor/supplier will advise on this. Most will want it to be a month old before starting on their grinding work. Therefore be mindful not to cover the floor with plastic or any other material that will cause the concrete to sweat and thus stop it drying out. Dust sheets are best. 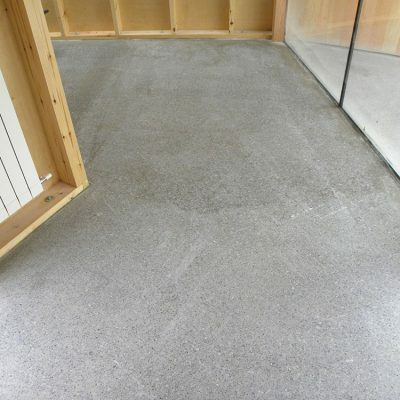 It’s acceptable to dry out a ‘normal’ concrete floor which will subsequently be covered with conventional flooring materials by running the underfloor heating gently for a week or so. But with a polished concrete floor this wouldn’t be a good move as it could cause shrinkage and cracking which would then be there for ever. Something to be aware of. And something that slows the construction cycle. 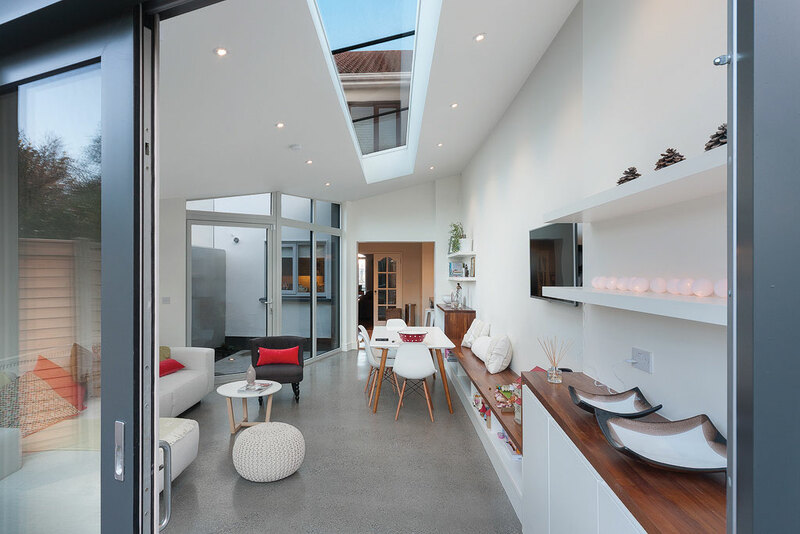 Opting for a polished concrete floor is not for the impatient! Whether you’re starting with a new floor or an existing one the polishing process is roughly the same. Diamond-tipped polishing machines are used, much like wood sanders, to cut through the top layers of the concrete to produce the finish you want. This usually involves several graduated steps and can be done wet or dry. Dry grinding is better in some ways because it is easier to clear up afterwards. However, great care must be taken to ensure you don’t inhale the dangerous dust. Professionals use machines that collect the dust at source and they also protect themselves with highly effective masks and clothing. The reason for such precautions is that it is possible to cause serious lung damage by inhaling this silica-rich dust. Grinding concrete wet is better in many ways but produces a slurry which then has to be disposed of. If you have a skip on site this can work well but this slurry cannot, of course, be put down gulleys or drains or it’ll block them. 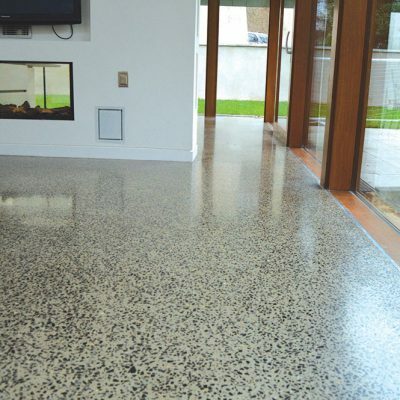 The secret of successful concrete polishing is to use a material called a ‘densifier’, which typically consists of high-solid lithium silicate or sodium or potassium silicates, at the correct stages of the grinding. 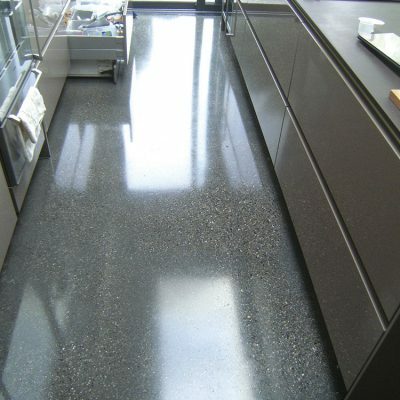 This makes the concrete surface harder as it dries and, once solidified, allows one or more abrasive cuts to polish the floor to the desired level of gloss. It also helps seal the floor. All this grinding takes a long time, even in the hands of professionals, because in small areas, such as in the average domestic build, it’s not possible to use commercial, large grinders like those used for a warehouse floor, for example. By definition, on a domestic scale there are lots of edges relative to the actual floor area, and this also slows everything down. Grouting materials can be used to fill holes, cracks or imperfections. Although it’s possible to hire smaller grinding machines I think grinding is a job for the pros. DIY type polishers can be hard to control, especially in small spaces, as they ‘float’ away from you easily and can be dangerous. It’s also a matter of considerable expertise to know how to grind the surface to best effect, when to use the densifier at the most appropriate stage, and so on. 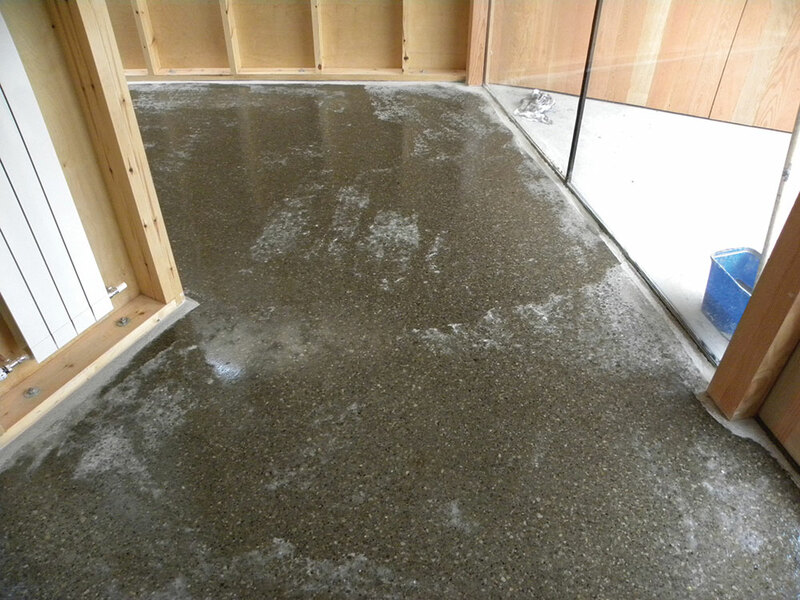 Polishing the concrete to a 3000 grit gives it a natural high gloss finish. Sealing with an impregnating seal, which doesn’t alter the appearance will give you a polished stone-like appearance. Topical seals or multi coat seals increase your maintenance, and can rip and tear if furniture or sharp objects are dragged (see Maintenance). Generally speaking, underfloor heating is the preferred heat emitter type for rooms with concrete floors. This is because concrete is a surface that’s ‘emotionally’ hard. 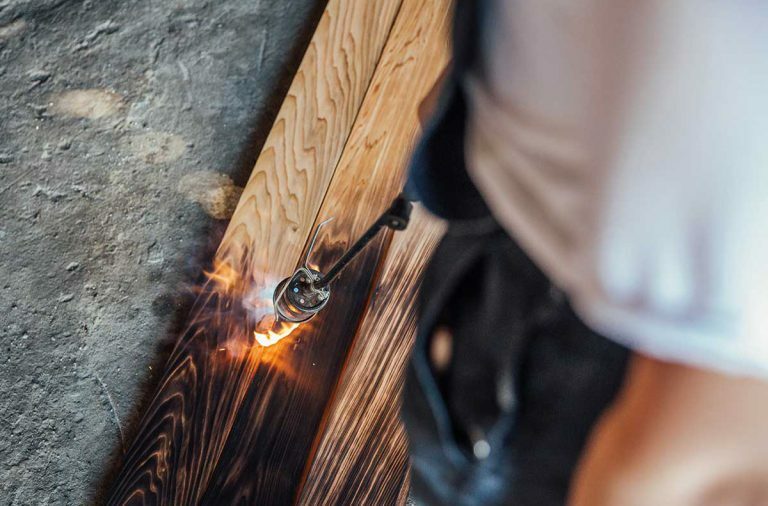 Wood that is only slightly warm feels subjectively warmer than concrete at the same temperature. In other words, you’ll never want to have the combination of ‘cold’ and ‘concrete’ whereas it’s possible to get away with ‘cold’ and ‘timber’, for example. 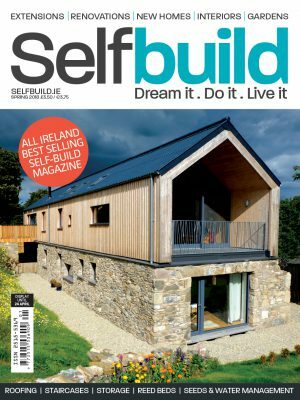 On a practical level, bear in mind that concrete is a good thermal conductor, so it’s vital that sufficient insulation be placed under the concrete subfloor slab so heat doesn’t go straight from your underfloor heating into the ground. It is normal building practice to avoid this from happening. Your heat-conducting, water-filled, underfloor heating pipes will be laid within the thickness of your final concrete floor. This is a very good setup as the concrete conducts the heat from the water into the room’s air very efficiently. The use of rugs will lessen this effect (see Of sound and rugs). On the topic of cracks (see Curing and avoiding cracks) if you have a polished concrete floor the water temperature – not the floor temperature – in your underfloor heating pipework should never be more than 35degC. Anything higher makes cracks much more likely. Note that if your home isn’t often used it’s going to be important to plan your heating very carefully. It is generally held that during the cold months of the year – which in Ireland means about eight months! 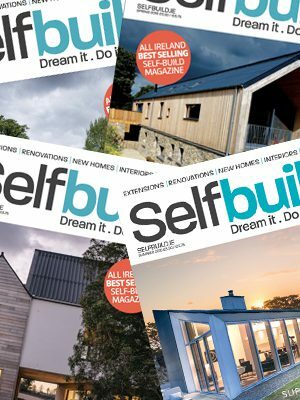 – it’s wise to keep the underfloor heating running low the whole time so the floor never gets totally cold. But even if left on this low setting, your concrete floor may take more than a day to heat up to working temperature. This means that in a not-much-used home it’s important to remember to switch on the heating at least a day or more before you intend to use the house. If the heating has been off for many days or weeks this catch up process can take several days. Of course, such control is now available remotely from your phone if you install the right kit from the start. 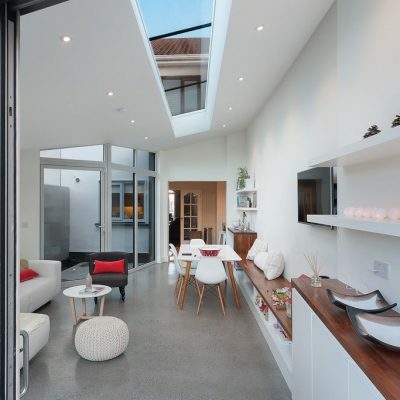 A concrete floor is hard and reflective, which makes rooms that have them feel acoustically ‘live’. Not only do surface noises such as scraping chairs, sound louder but reflected noises are also heightened. This ‘live’ sound can be unacceptably intrusive to many. This leads many people with noisy children/ domestic and electronic gadgets/equipment, etc. to use rugs. These can, of course, also break up the surface colour-wise and introduce another texture. But as soon as you place any such fabric on the surface of a concrete floor that has underfloor heating you start to lose heat. 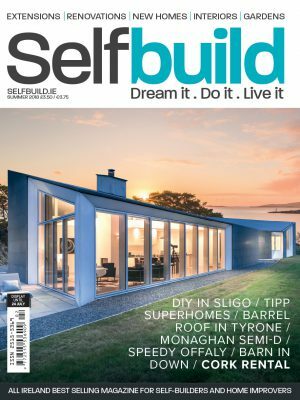 I’ve seen concrete floors covered with so many rugs, for softness and sound deadening, that the efficiency of the underfloor heating is severely diminished. So if you are likely to go down the rugs route, be sure to overspecify your heating pipes’ density at the design stage to compensate for the heat insulation caused by future rugs. Rugs also aren’t suitable for wheelchair users, or elderly people, who can find them a trip hazard. A way round the ‘live’ sound issue is to ensure that other surfaces in the room, such as furniture and curtains, are especially sound absorbent to compensate. On a daily basis don’t use chemicals on your floor; soapy warm water should deal with any kind of spills or stains. You may however find that children’s colouring materials/paints/felt tips/certain foods etc. may cause stains you can’t remove. This applies, of course, to any natural flooring material. Discuss this with your supplier. If you want to remove small scuff marks yourself, you could hire an industrial type pad cleaner. 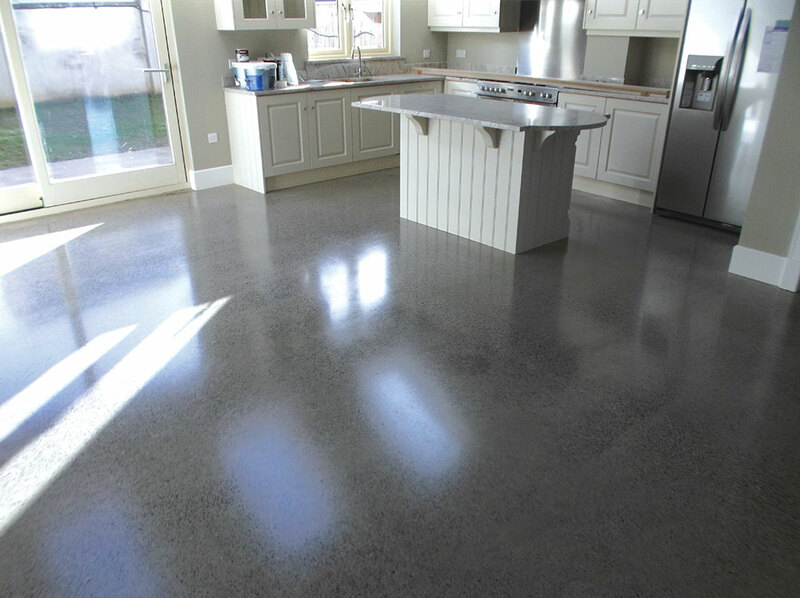 Ideally, concrete floors should be resealed once a year; this can be done within a 24-hour window but all of the furniture will have to be taken out for the day. 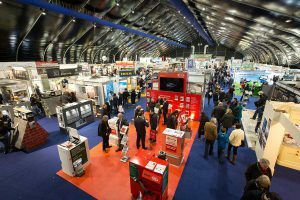 It’s a good idea to get the professionals in to do this; they will be best able to deal with scuffing and damage and will have access to the latest products which may not be available on the DIY market. 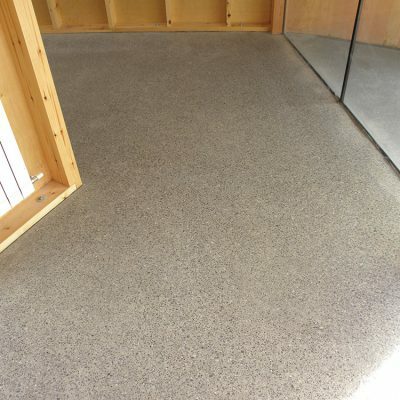 Costs range from €5/£4 to €15/£12 per sqm depending on size and location. Realistically you may only call in the experts once the floor starts looking terrible but don’t wait too long – if the floor is too damaged it may require much more work than a simple resealing. Drop anything on to such a floor and it will break/shatter. Concrete is totally unforgiving. 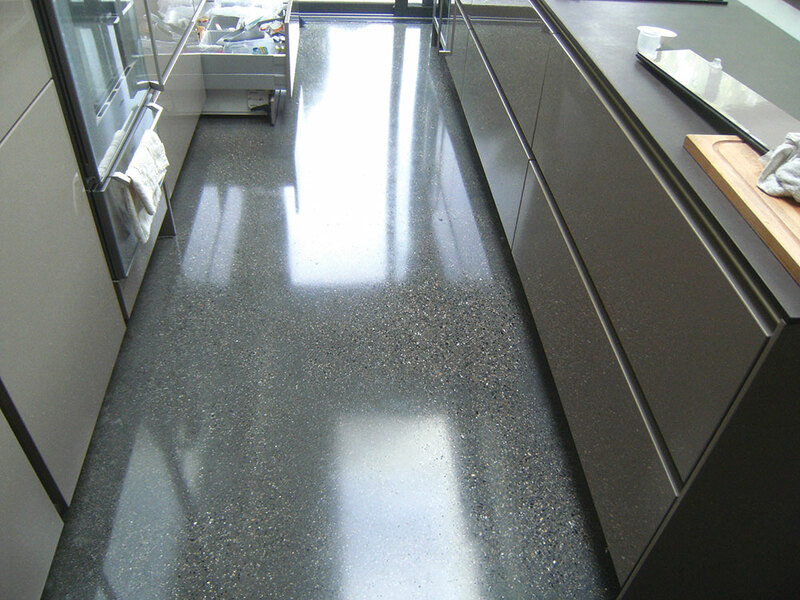 Especially if they are polished to a 3000 grit mirror-like surface, polished concrete floors will become slippery when wet. In a kitchen, spilled oil becomes hazardous. 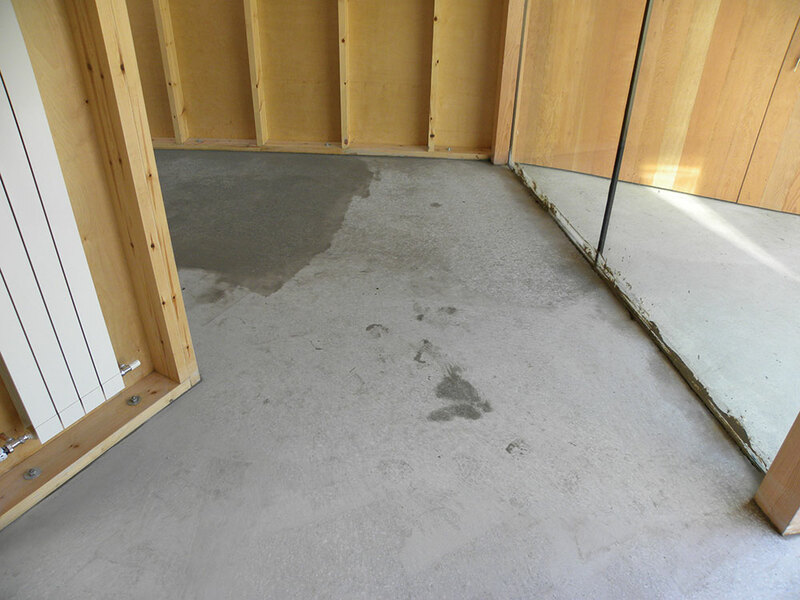 The surface must be resealed every year and as with natural flooring materials, can stain (see Maintenance). Standing for long periods is found by many to be tiring on the feet and legs, especially hours spent at the sink/kitchen. Unless the floor is heated you and your family may find the finish very hard/cold to lie or play on. Rugs can lessen this effect (see Of sound and rugs). You’ll also need a skirting board as repeated mopping and hoovering can otherwise leave unsightly residues at the junction of wall and floor, and plaster can get damaged easily. The skirting can be of standard timber or a stone/porcelain alternative if you wish to match the concrete. Some people, determined to keep to a minimalist design statement and able to control their cleaning equipment, try to get away with the concrete floor going right up to the wall. What you choose will be entirely up to you. If you opt for a high gloss finish, be prepared for a lot of reflected light glare, especially if you also have large areas of glazing. Can look highly decorative, e.g. can be scored in patterns to look like huge ‘tiles’, or in other ways. Can have a high gloss or matt look and can be coloured. Are easy to keep clean. Avoid the need for grout joints, which get dirty/ require upkeep. Can get very wet and be mopped easily; some other types of floor coverings may be sensitive to water. Don’t scratch, except at thresholds and other heavy-wear areas, where the surface sealer wears off over time. For instance, studded football boots, roller skates and the like won’t damage the concrete but they will scuff the sealant surfaces. Act as a heat sink for underfloor heating, feeling warm long after the heating has been switched off. Can be covered over with other flooring materials if you get tired of the look. 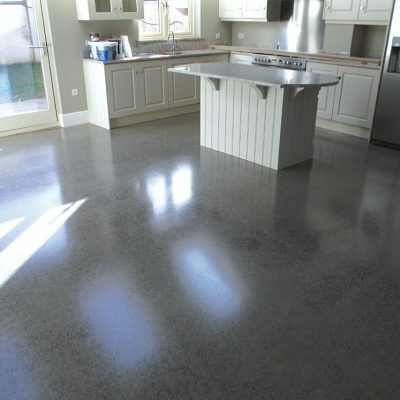 Many people who consider polished concrete floors also often like the aesthetic of concrete worktops. They can look very stylish, can be finished in several ways to make them look interesting, are easy to clean (if properly sealed from the start), are robust and can take under-mounted sinks and drainer grooves. Make a form (a melamine, or similar, base with a softwood frame) to your exact dimensions. Make sure it’s no less than 50mm deep. Lubricate the whole of the form thoroughly with olive oil. Insert a suitable steel mesh for strength (if it’s for a cut-out sink then ensure you use rebar around the edges of the form to brace it). Use a semi-dry mix of concrete to avoid cracking as it dries. You can get specialist mixes online. Trowel the top of the surface (this will end up being your under surface). Cover it to prevent it drying out too fast. Leave it for at least three days before removing the formwork and starting to grind the top surface. Use diamond pads and a wet grinder to get the finish you want. Use a slurry mix to fill holes. – Grind off the edges to make a bullnose; sharp corners are to be avoided. Final finishing won’t be possible until the concrete has dried out for at least a month. Hi Andrew, thanks for the interesting article. 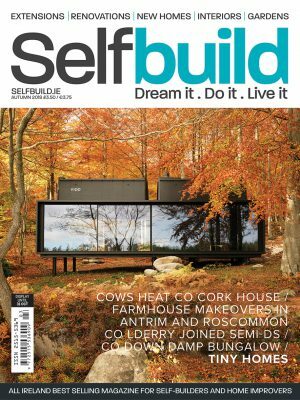 We are building at the moment and have plans for a concrete floor, would you advise polishing before or after the windows go in? We are getting opposite opinions from the window/concrete suppliers. Hi Nina, reply from Andrew as follows: The trouble is that every trade wants things to suit them best. If at all possible get the filthy job of grinding and polishing out of the way before the windows go in....especially if they are sophisticated, expensive ones that have all kinds of mechanisms that can get gunged up with the dust...that gets everywhere and can be hard to remove. This also allows some of the dust to escape! The alternative is to mask everything with almost surgical precision to keep all this out of the window mechanisms and even off the frames themselves which, with the heavy soiling, can easily get scratched.